Although there is a lot more that I could say – I have decided that this is my last response to the Ofsted report. I am picking up now on points 13 -20 which talks about the state of early years provision in England. Again I have to comment on the governments negative view of childminders – it seems the report is designed to show childminders in a poor light and not to acknowledge their strengths. The whole thing seems to be providing evidence for Wilshaw ‘s statements earlier this year to be justified – and to provide the evidence as to why us ‘poor’ childminders need more support than any other sector and that a agency or hub is the only way forward. The trouble with data is that it is possible to extract information to support any point of view – ask any uni student – it is possible to find evidence to support the most feeble and ill thought out idea – and make it sound not only like a sensible idea but the answer to ‘the problem’ – the problem of course being the one set by the person writing the assignment – or in this case the report. You may be surprised to read I agree with this – provided the term ‘other early years practitioner’ is replaced by the term ‘childminder’. What makes me so very cross though is we (the childminding community) have been there and done that – and it was successful – apart from the fact that it was not funded properly or long term. We had the children come first networks- which although a bit restrictive with regard to criteria such as number of visit per year required and assessment criteria – worked and many ex childminders or part time childminders were recruited as network coordinators to visit, assess and monitor childminders, and to provide training and support such as toy libraries. I was personally one of these network coordinators – and the only problem with this scheme was it was not funded sufficiently to allow all childminders that wanted to – to join, nor was in funded in the long term as so as funding was reduced / not ring fenced- money was diverted to other things, criteria was reduced and even removed and in many cases the children come first networks have been closed and local authority models designed to just facilitate childminders offering NEF and two year funding have replaced them. I realise that neither of these schemes are likely to be available again in the future because of the funding issues – but what these schemes proved is that childminders themselves can support each other given the means to do so via volunteer peer to peer support networks,that could be overseen by local authorities or the main charities such as NCMA and PLA but run by childminders themselves. People like myself could carry out this role (and there are many childminders like me with the experience, the knowledge and the proven record of leadership and management) . How it would be funded would be up to the government to decide, but from my experience as a volunteer and providing training and information sharing a lot can be achieved on a very low budget – and maybe childminders would pay as they use or even have a surcharged attached to their Ofsted registration fee to cover the costs. The membership organisations have a lot of experience in setting up and over seeing volunteer structures – so it makes sense to ask them to advise – or ask people like me! The next point I want to look at is the statements that say that childminders are not improving as fast or as much as other sectors of early years. This may be true but the report gives the impression that childminders are not improving (point 19 ‘Childminders have performed consistently worse than childcare providers on non domestic premises’) and even that are incapable of improving because (point 19 ‘some childminders still find it difficult to assess children’s starting points’). These statements need unpicking – until 2008 most childminders (unless they offered NEF and were part of a network) did not have to work to a set curriculum – so compared to other sectors of early years childminders have had to make considerable more adjustments to practice – and most have done this – as is shown by the figures provided by Data View. In 2009 so the first full year after the introduction of EYFS 08, 9% of childminders received an outstanding grade and 56% a good grade – this has improved each year and now stands at 10% outstanding and 61% good – meaning that there has been an increase of 6% of childminders who have been judged as outstanding or good. Also in 2009 36% were satisfactory or inadequate and at the end of the EYFS 08 cycle 29% were satisfactory or inadequate – so an improvement of 7% over the cycle of EYFS 08 – a remarkable achievement for a group of providers who mainly work alone, who work in their family home with the associated restrictions that brings, who work with mixed aged ranges, who struggle due to working alone and hours worked to attend training and meetings, who have to do everything themselves- so even after all the children have gone home there are hours of paperwork, cleaning and sorting to be done every weekend (or during evenings). I wish that instead of highlighting the negatives the government had highlighted the positives and just how far the average childminder has travelled in during the last 4 years. This negative attitude of the governments is not doing anyone any favours – yes there is a percentage of childminders who are not improving as fast as maybe the government would like -but there is also a percentage of pre schools and nurseries who are also not making significant progress. It would have been nice to have had a positive report from Ofsted that celebrated the achievements of the early years sector and in particular the childminding sector. My(almost) final point is – until we have the data to prove that children who attended childminder settings – and the corresponding data about qualifications and Ofsted judgments – we can not be sure that these children are the ones not doing well in the end of EYFS profile assessments. And food for thought – what about the children who stay at home with parents or are cared for by grandparents while parents work – what is the comparison of their assessment results – and not only the end of EYFS assessment but the Key Stage One tests as well , and the end of primary school and the end of high school ones – because I have a feeling that those who have had more of a home based early years experience will in the long term do better – certainly the children I have looked after over the years have all gone on to university or well paid jobs, and successful relationships. My final, final point is – how about a rethink – what about registering all childminders under basic standards of safeguarding – but then giving the childminder the choice of remaining on a list of registered but ungraded childminders – or choosing to have a graded inspection , and becoming an EYFS childminder – as and when they are ready, because to be frank some childminders just want to provide a safe, home from home environment, where safeguarding is paramount but without the need to meeting the learning and development requirements – and some parents also want this type of service . So why not give parents the choice – after all those parents who choose to use a nanny have this choice why can’t other parents have the same choice – a registered, graded and regularly inspected childminder or a registered childminder who meets satisfactory requirements and is insured etc but who does not follow the learning and development requirements . Maybe different names might be needed or a pre fix to ensure everyone understood the difference – and of course those who choose not to be graded would not be able to access quality improvement funding or NEF – but for some childminders that would not be an issue. Surely it is better to offer choice to parents and to childminders than to ‘tar all childminders with the same brush’. If we are potentially going to have a two tier system why not give childminders the choice about if they want to be a EYFS childminder or not. This blog post is going to look at points 6,7 and 8 of the report, as these points are all linked. Overall, pre-schools and nurseries are better than childminders at preparing children for the next stage. Although most childminders provide children with a good level of care, many have found it more challenging to provide for the learning and development set out in the Early Years Foundation Stage. The choice of words is misleading and frankly insulting to childminders. I have already mentioned in Part One of my response about the number of children who are not receiving childcare and education that has been judged at good or above, pointing out the huge difference in the number of children in childminder settings and the number in pre school / nursery settings. I now want to explore the actual childminders – the report says that 29% are judged as less than good – so that means 71% are judged to be good or above. Within the pre school sector, 21% are judged to be less than good and therefore 79% judged as good or above. So why is there not a general statement about pre schools / nurseries finding it challenging to meet the requirements of EYFS (pre schools / nurseries in this group are described under point 8, as ‘weaker’ ) – we are talking about a 8% difference in number of childminders judged lees than good and the number of pre schools / nurseries. I find the difference in choice of words about childminders and pre schools / nurseries to be unacceptable – it is clear that it is not just childminders who find aspects of EYFS ‘challenging’. We all work to the same framework and as with all things some will find it more difficult and need more support – and it is right that this is highlighted – it is not right that headline points (and video clips) give the impression through choice of words that one sector has significantly more difficulties than another sector. Shame on you government – if I used such discriminatory wording to describe the development of the children in my care – I would be held to account – I am holding you to account on your discriminatory wording. It is likely that the quality of early learning would benefit from strong links between weaker and stronger provider, including good schools.For example, childcare provision linked with a children’s center is generally of higher quality than provision that has no such association. I have to ask does the government not realise that many childminders have been trying to make links with schools and children’s centers for years? Some schools refuse to work in partnership with childminders, some children’s centers although willing, do not have the capacity and so many offer a once a month drop in (some are able to offer childminders access to all activities). This aside – The main issue is that the type of early learning offered with children’s centers and schools simply is not appropriate for childminders working with small groups of children, often mixed age groups, often under 3’s. And lets look at the practicalities of possible ‘association’ – namely the timing of such events – maybe meetings, maybe training – anything in the normal opening hours of schools and children’s centers is not appropriate due to the fact that childminders will usually have children in their care at those times. Early evening events are also not suitable for many due to the fact that childminders provide extended hours care – often to 6pm, frequently to 6:30 and sometimes later. When I have asked in the past about providing training in children’s centers later in the evening (so ending at 9:30 or even 10pm) I have been told not possible because of the cost of caretakers to lock up, and center staff being unable to help due to cut backs in TOIL hours. Much more could be done to improve links and to share information – but for the actual daily practice aspects – childminders need support / advice from those understanding childminding – and best practice would be – in my opinion support from another childminder or someone who has had experience of being a childminder. I find it interesting (amusing even) that the government is not suggesting that as a outstanding childminder that I go and support my local children’s centers with a lower judgement than myself – or my local school that was at one point in ‘special measures’. Of course I am pleased that I have not been asked because my knowledge, skills and experience are not appropriate to be used to advise / support schools or children’s centers – but why does the government not understand that this works two ways? There is a strong case for good and outstanding providers with high quality leadership and management to operate a nuclei or ‘hubs’ for networks of childminders and weaker group care providers in their area. Such hubs would drive improvement through advice, support and training. They could also take on the role in registering and overseeing smaller providers. It is talking about childminders (so all childminders?) not just the ‘weaker’ ones being managed by those with high quality leadership and management – and because it also mentions the role of registering and overseeing smaller providers – I am reading between the lines that the government has decided that childminders (clearly the smallest type of provider) will not be able to take on this role – and worse, far worse that someone could register and oversee (does that mean inspect if they are going to have the power to register?) my setting that has no experience of childminding. I can not find reference to childminders and weaker group settings having choice in this – it appears from this document that there would be no choice. What will parents currently using my service make of this? What will prospective parents think? I know what I would think – those providers that are ‘overseen’ by others and not Ofsted – must be poorer quality, not as good – I think I would choose to send my child to a setting that was inspected directly by Ofsted. Wouldn’t you? And what about the cost of this unwanted support and overseeing? My guess is the government is not going to pay for this – and that I would be required to pay for it myself. JUST WHAT IS THE GOVERNMENT THINKING? This would not drive improvement – cross sector support is not the way forward – support needs to be sector specific. There is a big difference between working in partnership across sectors to being ‘overseen’ by someone from a different sector. It would lead to people like me, giving up childminding – and at my age this is not a good time to have a career change – so would I become ‘unemployable’? And if it was optional – just how would that work – some who choose to be involved and some who don’t? In my experience those who have the higher judgments are the ones who already seek support and seek training opportunities, those who work in partnership with other professionals – and they will choose not to pay for something they can put in place themselves. Those who have the lower judgments do not seek support – for a variety of reasons including the costs, the timing, and the willingness to do so – so these people will also have reason not to choose to be part of such ‘hubs’. When will the government start listening to the sector and realise that ‘agencies’ ‘hubs’ or whatever name they come up with next – just will not work unless ALL settings have to (by law) be registered, inspected and ‘overseen’ by such a body. A hub is not a totally bad idea – if for peep support, and if free (or very low cost). However (maybe I am missing the point) don’t we already have ‘hubs’ where we can access training / support when we need to – are they not called ‘Local Authorities’ and ‘Training Centers / colleges’ and ‘membership organisations’ ? Why spend such large amounts time, effort and money on debating this (and if the government continue down this road) on implementing and managing this (because I am assuming that the hubs would be approved / inspected and so on to ensure quality and consistency)? Why not invest that same time, effort and money into supporting the ‘hubs’ already in place? I am actually now looking at point 4 of 31 – so I think there might eventually be many more parts to my response. ‘Our inspection evidence shows that what makes the most difference is the quality of the interaction between adults and children, which leads to them developing good early skills’. Unfortunately neither the information in the report or on Data View, give a break down for this particular aspect – which is a shame if it is considered to be the aspect that makes the most difference in quality. I would be really interested to know the figures for this because my gut feeling is that many childminders could do well in this aspect – partly due to the low ratio’s in a childminder setting and partly because of the typical routines and experiences provided. The data in the report on ‘The extent to which children achieve and enjoy their learning’ does give a hint because although all providers are grouped together, the % of settings getting outstanding in this aspect is 15% -an increase of 4% on the % for overall effectiveness. I find the fact that the inspection evidence suggests that interaction between children and adults is most important, very interesting , I wonder why this is therefore not one of the judgments? I have always talked to the children, always listen to them, always asked open questions, always been led by their interests. That is before I did my level 3 qualification, before I studied at university, before I started reading childcare books and way before the internet. Am I unique in this? – I don’t think so – but I am of a certain age, brought up before TV was over used, before mobile phones, before computers – in other words when people had time to talk – in person to each other. Of course this skill in talking is not limited to my generation – many younger practitioners also have this skill – but and I think it is a bit but – many of these ‘natural’ childminder practitioners who instinctively ‘know’ that it is right to interact with children and therefore provide an excellent environment for language and communication – ‘clam’ up whenever an inspector enters the setting – in fact there is a ‘double impact’ because many childminders on reading the EYFS, on attending training courses, feel inadequate – they feel their ‘gut instinct is not good enough and that they are lacking in the skills needed, and so because of this double impact on their confidence, the childminder does not interacted effectively with the inspector, and as a result, the inspector is unable to make a true judgment . For these practitioners who find inspections terrifying, no amount of qualifications will make a difference – yes they may learn the theory behind what they instinctively know – but that won’t give them the confidence to act ‘normally’, to speak to inspectors, or to gain confidence in their own skills and knowledge – and so they will continue to be judged as being weak in this area. Therefore for this aspect, the problem is often the practitioners inability to interact with the inspector due to lack of confidence – rather that lack of knowledge or qualification. So tying this in with conclusions made in the report – the inspection outcomes for childminders who do not have a level 3 qualification should not directly be linked to poor practice / poorer outcomes for children because I think on non inspection days a much higher and effective level of interaction is seen. This of course means that as most children will only experience one inspection during their time in a childminder setting, they will only have one day where interaction is not as it should be – and therefore will not impact on their outcomes or profile results. As interactions are considered the most important aspect of practice by Ofsted, data needs to be collected about profile results of children at the end of early years foundation stage to show results of children who attended each type of setting before entering school – before any worthwhile conclusions can be made, and as mentioned before consideration needs to given to making interactions a judgment rather than part of an overarching judgement. And one final point – it must be remembered that the data used is pre EYFS 2012- and before there was more flexibility to be judged on practice and outcomes of the children rather than paperwork and ticking all the ‘right’ boxes. Time will tell if inspection judgments improve during 2012 – and particularly within the childminding sector but what is worrying me is the government are planning drastic and far reaching changes – before EYFS 2012 has been embedded or has any data based on those inspections. The question in my mind is what if EYFS 12 is the framework that does improve outcomes – but changes are made that reverse that improvement? Surely anything ‘new’ should be given chance to prove itself before its replacement is planned? If you have not read part one – please take the time to do so. So to start with – the point that too many children starting school without the skills they need to be ready to learn. 1. Children start school too early – they are expected to sit still a lot of the time, they are in classes that are to large for such young children and the ‘curriculum’ and school timetable and routines are not appropriate for 4 and 5 year olds. It horrifies me that government think the answer to this is to start formal learning even sooner and to constantly push for children to be ‘ready for school’. When are the government going to realise that if children started school later – then children would be ready for school – I wonder if government education people have ever looked at a child development book or studied brain development. 2. Children are not given time to be children, the curriculum in the EYFS although quoting appropriate statements about learning through play and the research behind it – actually leads some practitioners (and Ofsted Inspectors and LA advisers) to think that children should be directed and given activities to do (as in the sit at a table type and circle time type) – all of the time. If as a child you are not allowed to play, to set your own agenda and goals, to ask questions, to have time to think, time to experiment and learn through trail and error, to be physically active at times and do ‘nothing’ at other times – and if instead you are told it is circle time, it is story time, and worse – it is tidy up time – you are not going to have the skills needed to be ready for school. I remember a well respected reception teacher at my local school saying to me many years ago ‘ Penny, here in school we always know if a child has been to your setting because they have the skills needed for a good start to school life – they can dress themselves, go to the toilet themselves, ask when they need help, they have manners, they know how to sit to eat a meal, they have experience in using a pencil, scissors and threading, they know how to play by themselves and with others, they are willing to have a go, and learn from their mistakes And of course they all can talk well and listen to adults’. As my professional links have extended, I know many reception teachers and most, if not all of them would prefer a class of children with those skills listed above rather than a child who has experienced the entire EYFS. The funny thing (well no it is not funny) is that the things the report mentions as children need to be able to do, are those from the three prime areas – and very much in line with the list above, so I have to question why does the EYFS have the four specific areas? In my opinion although these areas will of course be touched on during time at any early years setting – why are they insisted on and have targets (goals) set for them. Lets go back to basics – lets get the foundations in place first – and think about the rest later – much later when the child is developmentally ready for it. Of course some children will be ready before 6 or even 5 to start building on their foundations – but that can also be achieved without sitting at a desk and without formal goals. Children who lead their own learning will achieve more than children who have the goals set by those they don’t know them as individuals – ie the government through a one size fits all list of goals. Linking all this back to the Ofsted Early Years report and very negatively sounding wording about childminders. I wonder if anyone has actually got any data on the children who have attended childminder settings? – are they the children who are not doing well? Or is it the children from group setting,? or children who have not been to any setting? just the children from deprived areas? and just those from deprived areas that went to childminder settings? In my opinion it is dangerous to link two pieces of data together without detailed analysis of that data and indeed the linking data that has maybe not yet been collected. The data on number of childminder settings without level 3 qualifications and the data on childminder settings with lower than good judgments does not mean that all the children who attended those settings are the ones who are not doing well at end of foundation stage. The picture will without a doubt be far more complicated. And I shall start to unpick this in part three as I examine other statements within the report. I have decided to put my feedback on my blog in stages – so this is part one. I feel the comments made by Susan Gregory are sweeping and unfair to the huge number of Childminders who have an outstanding or a good judgement on their practice. Figures from the report show that 10% of childminders have a outstanding judgement – that means using figures from the report that over 28,000 children are receiving outstanding care and education. Furthermore 61% of childminders have a good judgement and so over 172,000 children receive good childcare and education. The maths therefore say that over 200,000 children receive outstanding or good childcare and education at a childminder setting. Of course a lot more children receive outstanding or good childcare and education within a pre school setting – due to the number of children that attend each setting. Personally I think the government is attacking (and yes I do feel as a childminder that the government is constantly attacking my profession) childminders without fully unpicking their own data. If we look at number of children in satisfactory care we can see that just under 8,000 children receive satisfactory care and education at a childminder setting, and just under 3000 children receive inadequate care and education. Of course this needs improving and I will talk about this later in part two. However if we look at the figures provided for pre schools, the number of children who receive satisfactory care and education is just under 216,000 children. In the pre school sector there are no children receiving inadequate care. So if every child matters, and outcomes for each child are important, more children receive care and education below a good judgement within a pre school setting than within a childminder setting. I am aware that the figures provided in the report do not break down how many children are in each category and so I am only using the % figures – but in each case the actual numbers of children could be better – or worse. Before colleagues in the pre school sector think that I am attacking their profession – I am not, as I think that both within the childminding sector and pre school sector there are many complex reasons behind the judgments that are made. Both sectors need support to help make the improvements needed to ensure that all children receive high quality care and education. My comments are directed at the government – in my opinion the recent constant negative views about childminders are unfair and do not look at the overall impact on the children of this country as a whole. It would be far more positive to provide support to all sectors and not to constantly devalue and demoralise one particular sector. I have to say that as a childminder (and I know many childminder colleagues feel the same) that I question why the government has asked childminders to jump through so many hoops – and which a huge % of childminders have complied with, if the government has such a low opinion of the professionalism and the quality of care provided. I also need to question the cuts to budgets for the early years sector – both to local authorities and to membership organisations – at a time when the government is asking childcare providers to attend update training, increase level of qualifications, and improve learning environments. All of which stretch provider budgets – and at a time when providers are unable to increase fees to parents to cover these increased demands on budgets. If the government want to improve outcomes for children and inspection judgments – the government needs to support this and not expect providers to cover these costs out of the personal pockets – because the truth is settings do not not have the funds to do this so owner managers often not only do things for free in their own time but subsidise the setting by providing things for free as well. Maybe I am being a little judgmental myself – but could it be those settings that are receiving the lower inspection judgments are not in a position either as a setting or via goodwill of owners / managers to invest in training / qualifications, and so on? 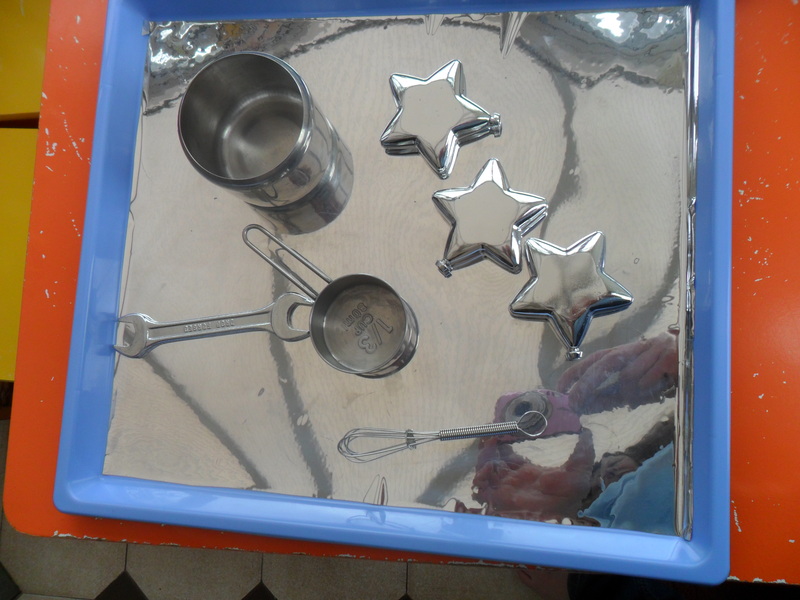 So the children and Penny set about making some mirror trays – Penny had wanted the ones in TTS -the set of 3 different shaped ones – but thought they were a bit expensive. 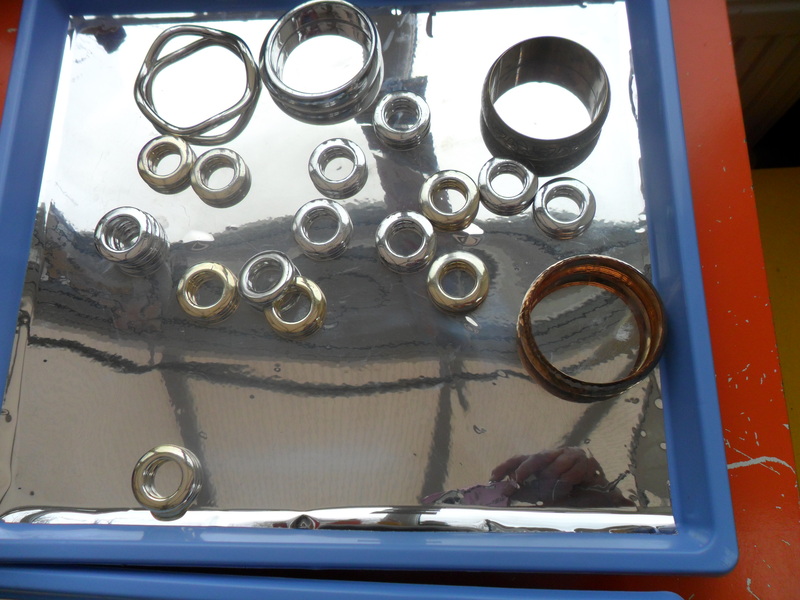 Penny has some lovely blue trays – curtsy of Carol (from hospital – the used trays that hold the clean instruments for operations). Penny cut the mirror roll and the idea was that the children would help stick the mirror onto the tray – but it proved to be a bit tricky – so Penny did it while the children watched – and gave ‘helpful’ comment and advice! 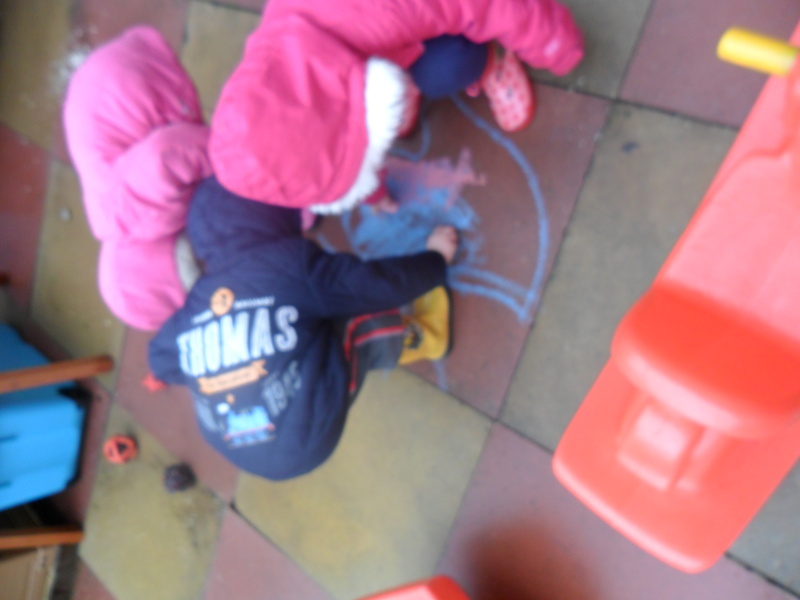 Today the rain finally stopped -and although rather cold and windy we wrapped up and went outside to play. Penny did wedge the pop up play house between the bench and the side gate to stop it blowing away – the children used it a lot – maybe to get out of the wind. The parcel man made more deliveries today – namely 100 glue sticks (yes I know rather a lot but as worked out at 43p each for the TTS own brand large ones – too good a bargain to ignore)and a sorting / game set of compare bears (or Three Bears as often called). Anyway the things in the box were not that important – but the box was! All four children played in the box for a long time. Yesterday my daughter Michelle returned some more things that she has had at her setting. In fact these are shared resources where we combined our collections to make bigger sets more suitable for several children to play together. Sometimes it makes sense and saves having to store everything in one setting by sharing ownership of somethings and sharing other things owned by another person. As well as sharing with Michelle, I also share with my friend Carol, in particular the light box that we jointly own, but also borrowing things to support interests or topics. But the ponies were left out ready for play on Monday. I had Erin in mind as when she returned from her holiday (visiting grandparents in Poland) she brought a Polish edition of a ‘My Little Pony’ magazine, which her Mummy has given to me to use in the setting to support Erin’s play and use of Polish. I should mention that I do not speak or read Polish, however it is good for Erin to see her language in print in my setting and to know that we all value her language. The beauty of the comic is that the ponies in the story still have their names in English, so I can read those and due to age of Erin and her friends I can tell stories from the pictures – and I do tell the children that the writing is in Polish and I am not reading it. In my opinion is does not hurt to be truthful about things. 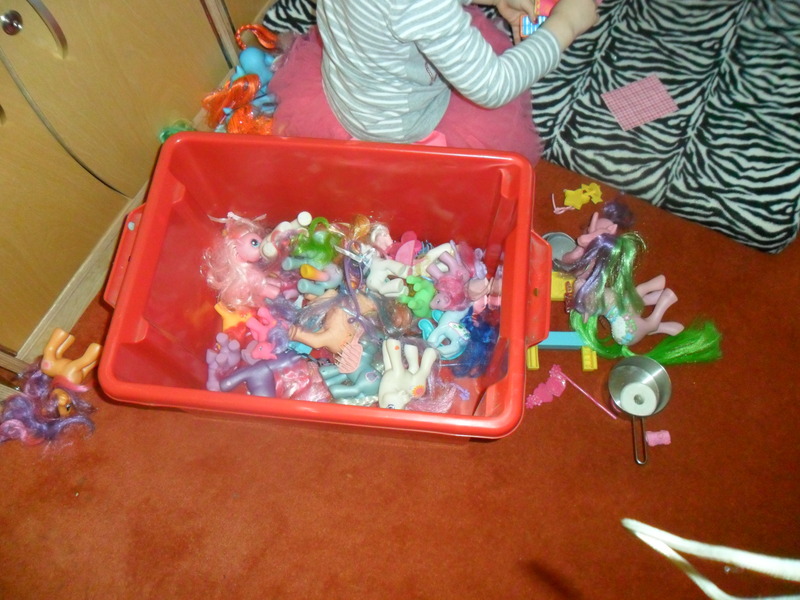 So as Erin arrives before the other children on Monday she had the ponies to herself and soon got ‘stuck in’ exploring the contents of the box and then choosing the ponies and accessories that she wanted to play with. Also before the other children arrived, Erin made her polar bear by sticking cotton wool on to a pre printed and cut out polar bear. (The other children had completed theirs last week. 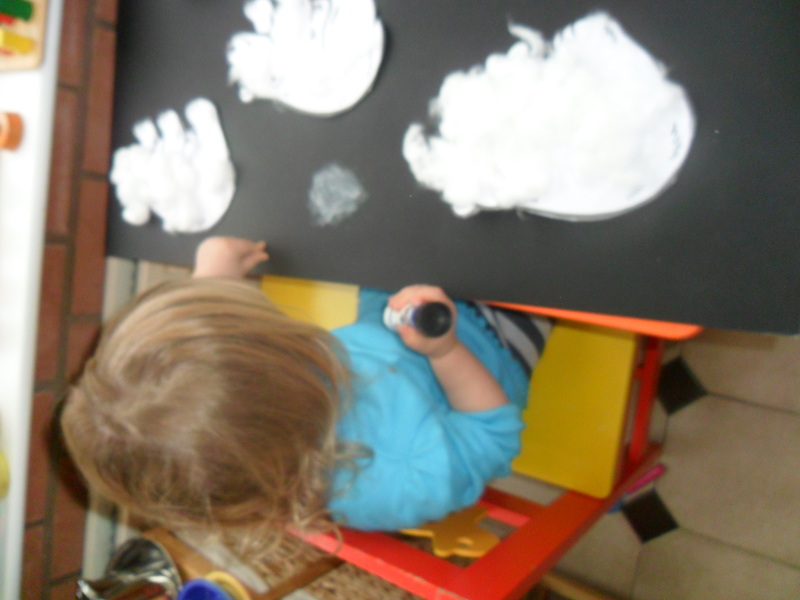 Erin remarked that the cotton wool was soft, and ‘like a jumper’ – she also observed how it stuck to her fingers. 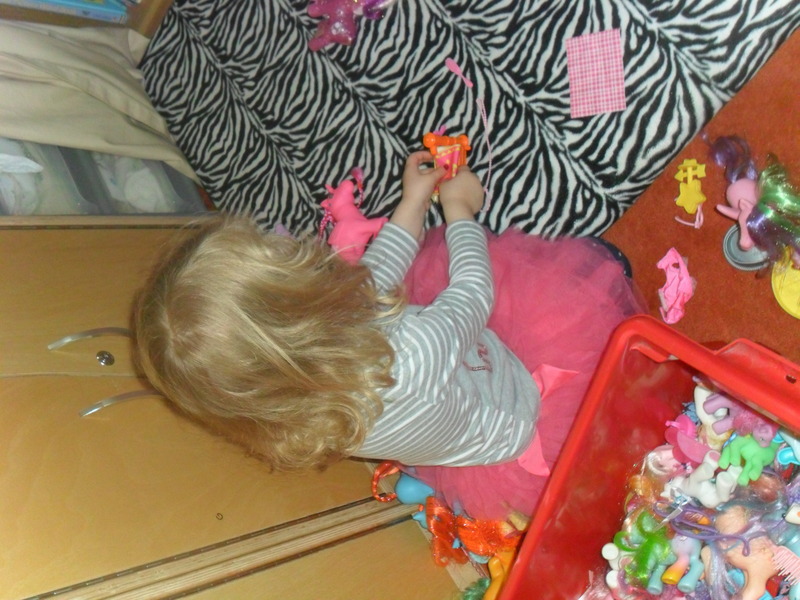 Once the other children arrived there was lots of free play, particularly with the heuristic type play things as over the weekend Penny had changed some of the continuous provision and put out a few additional resources – as well as changing position of somethings and removing other things. We also danced to Busy Feet, had a story about polar bears – and of course had the usual snack time and lunch time. 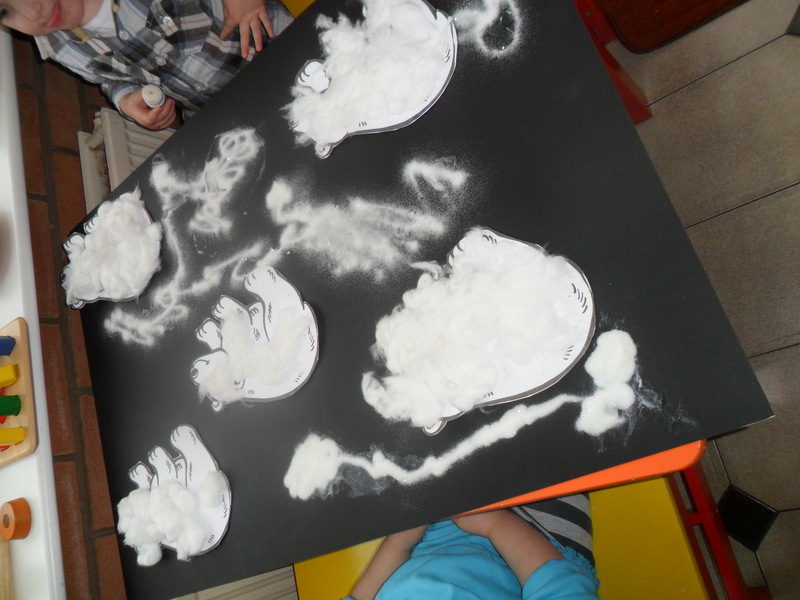 Then after nap time all the children worked together to create a ;large polar bear display. Penny provided a large A1 piece of black card, the children stuck on their polar bears (using blu tac – so could take home own polar bear once display taken down). Oh and the post man delivered a roll of mirror roll – but we will discuss that in another blog.